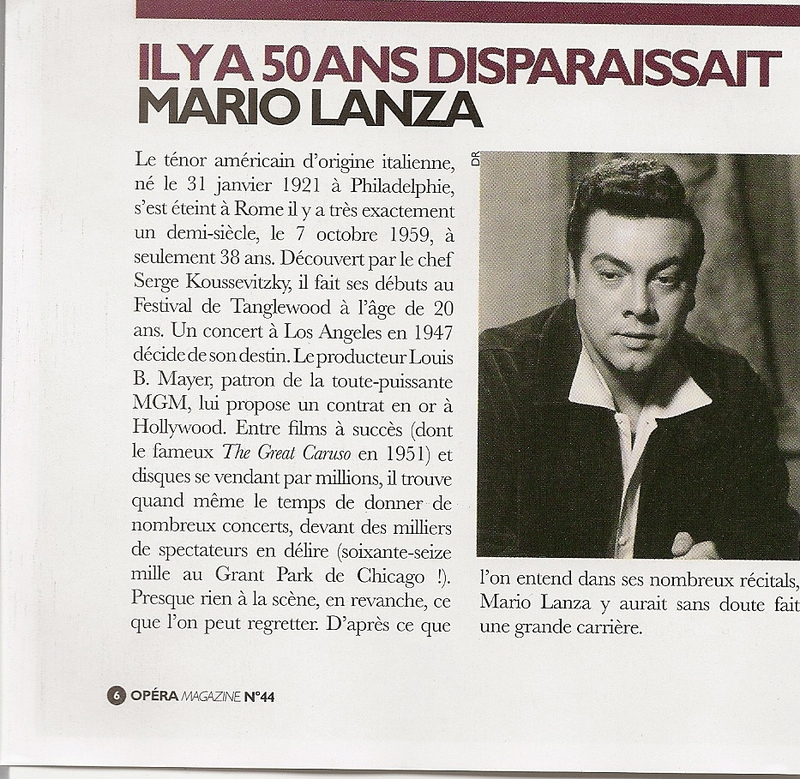 In the fall of 2009, we wrote to Opéra Magazine here in Paris to remind them of Mario Lanza’s passing in October 2009 and of the many commemorations all over the world of that sad event. 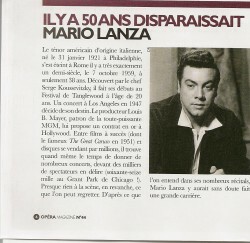 Opéra Magazine had not forgotten and in their n° 44, october 2009, right on time, they published their article (page 6) with a nice photograph of Mario Lanza. « The american tenor of italian origin, born in Philadelphia on january 31, 1921, passed away in Rome exactly half a century ago, october 7, 1959. He was only 38 years old. « He was discovered by the conductor Serge Koussevitsky, and made his début at the Tanglewood Festival at the age of 20. « A concert in Los Angeles in 1947 changed his destiny. The movie producer, Louis B Mayer, head of the powerful MGM, had him signed a golden contract in Hollywood. While playing in several successful films (including the famous « The Great Caruso » in 1951), he sold records by millions and yet found time to give many concerts to thousands of enthusiastical people (seventy thousand people in Grant Park, Chicago !). « But almost nothing on the grand opera stages, and we can only regret that. « Considering what we can hear in his many recitals, no doubt that Mario Lanza would have had a great career on the opera stage too ». This short hommage says it all, with density: the great voice, the huge success in cinema, in records and on stage for recitals and concerts, but almost no opera career or performance (except Madama Butterfly, by Puccini at the New Orleans Opera House under the baton of Walter Herbert, and before that, at Tanglewood, in Otto Nicolai’s « The Merry Widows of Windsor », under Boris Goldovski’s direction). But let’s have no regrets for what might have been. In reality, this young man who loved so much life and family life looked older than his age, and had begun to die day after day from some inner dissatisfaction that money and glory would not suffice to compensate. That great artist was dying of poor self esteem although – or because – more than any person in the world, he was aware of all the incredible gifts bestowed on him, and he felt that he was not doing enough or was not given the opportunity to do more to regain the esteem of his most rigorous judge: himself. It often happens with true artists, yearning for more and never satisfied. Mario Lanza was certainly insecure under the naive bravado that some say he sometimes displayed. Elementary ! Obviously he had not heard himself on stage and could not « crawl out of his skin to realize how good he was », as some one put it about him. Had he left the films for good and performed only on operatic stages all over the world, only opera lovers and amateurs would remember him as another great voice and a member of a Pantheon inhabited by the Corelli, Di Stefano, Schipa, Gigli, Lauri-Volpi, Bjoerling, Bergonzi, not to mention Caruso. Mario Lanza was not of that sort. Generations remember him, discover him. It’s not a matter of nostalgia. Each time a young person hears Mario’s voice, Lanza strangely springs up again in rebirth, as we experiment it each time with amazement, with musicians or non musicians as well ! Mario Lanza was a reference or a standard by himself and he stands alone, half a century after his passing, forever young, shining within his own light, beyond any singing, beyond any career; his soul voice paying the high price, the soul price, giving it all, capital plus interest. In our speedy, hasty, fast moving world, the year 1959 is so far from us, another time, another era, almost lost in the « memory haze » (to use the beautiful lyrics of « Golden Days », sung by Robert Weede and Mario Lanza). But when after so much time, so many years, so many changes, so many events and revolutions in the world, a human being shines on (just type « Mario Lanza » on Google or YouTube !) through the beauty, through the emotion, through the truth which flows from his voice, then be aware that there is a living soul, the essence of a life, somewhere over that « rainbow », « iride di pace » in italian, « iridescence of peace ». So let that bright light shine on and on to where it belongs: peace of the heart.